Which has a larger opening, a 40 mesh screen or 20 mesh screen? What’s the micron equivalent for a #325 US test sieve? What’s the difference between a 60 TBC and a 60 Market Grade screen? Which has more open area, a 16 Mill Grade or 16 Market Grade? 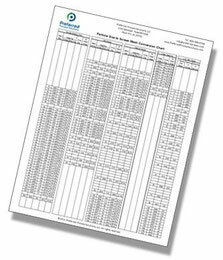 Get the answers to these questions and more with our easy to use Screen Mesh Conversion Chart. SWECO Round Separators are ideal for separating solids from liquids or segregating dry materials into various particle sizes. Proven design, long screen life, and easy screen changes are features that have made this device the most versatile and popular screening machine in the world. SWECO Rectangular Separators deliver capacities higher than what can be achieved on traditional round separators. Available with linear, round, or elliptical motion, these separators offer features such as zero grit bypass made possible through the use of innovative inflatable seals. SWECO GyraMax and BigMax Gyratory Sifters offer very high capacities with exceptional screening efficiency. With easy access to screens through hinged doors at each end of the machine, screens can be inspected or changed in a matter of minutes. SWECO Centrifugal Sifters employ centrifugal force generated by beater bars to propel material against the interior of a cylindrical screen. Achieving forces many times that of gravity alone, these units deliver exceptionally high capacity in a small footprint. SWECO Turbo-Screens use high velocity air to convey feed material to a screen and to drive fine particles through the screen. The result is especially high capacities through relatively fine screens.